Silica exposures kill over 1,000 workers a year in the UK and leave many more fighting for breath. But, unlike its US counterpart, finds Hazards editor Rory O’Neill, the Health and Safety Executive (HSE) is following the industry line and says our deadly silica exposure standard is just fine. 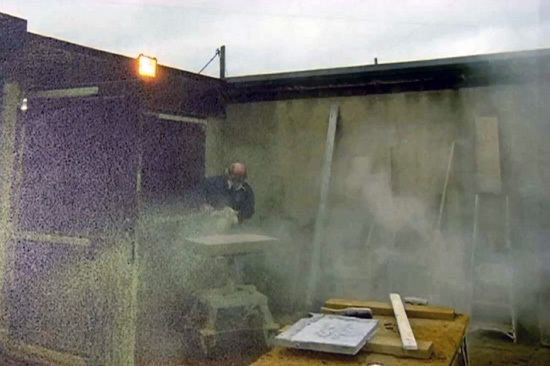 When the Health and Safety Executive (HSE) visited Teesdale Architectural Stone Ltd (TASL) in September 2007, it discovered workers were facing unacceptably high exposures to crystalline silica, a dust that can cause lung cancer, the breath-stealing disorder silicosis and other serious diseases. In two letters, the regulator told the Barnard Castle firm to clean up its act. Then it did nothing. After all, the company had written twice to assure the watchdog improvements had been made. Only they hadn’t. Five more years passed before a return HSE visit discovered workers were still facing a lung-clogging and potentially deadly daily dose of dust. • In the UK, the official workplace safety regulator the Health and Safety Executive (HSE) is resisting behind closed doors any shift to a more stringent silica exposure standard that would help prevent cancers, lung and kidney diseases and other potentially fatal conditions. Affected workers have no say. • In the US, the official workplace safety regulator, OSHA, is arguing at public hearings for a rule change to halve the same exposure standard. Affected workers have given evidence at these government hearings. • In the UK, HSE is arguing the industry line about potential costs in implementing new controls and technical difficulties in monitoring a tighter standard. • In the US, OSHA is challenging the industry line about potential costs in implementing new controls and technical difficulties in monitoring. It says the changes are technically feasible and, as well as saving thousands of lives, the tighter standard would not lead to job losses but would deliver multi-billion dollar savings to the economy. • In the US, OSHA says introducing a more protective standard will drive the development of improved monitoring and control methods for workplace silica dust. • In the UK, HSE has nothing to say on the issue of tighter standards driving improvements. It is a major hazard that for over two hundred years has been disabling and killing workers in industries including foundries, ceramics, jewellery manufacture (for example, agate polishing), sandblasting, tunnelling, brick making, mining and construction. Silica in soil can lead to significant exposure in agricultural workers on highly mechanised farms. Cases of silicosis have been reported outside the UK in workers sandblasting denim garments for sale on the UK high street. Over half a million workers in the UK are still routinely exposed, a figure that could increase sharply as the fracking industry develops. And while dust control technologies have improved over the years, work methods – particularly the nearly universal use of power tools – have massively increased the potential silica dust problem when these controls are not properly applied. 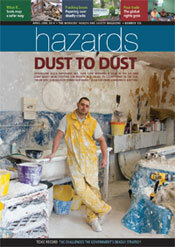 HSE’s own surveys have established failure to control this deadly dust is commonplace across industries. Silica trails only asbestos as a cause of occupational cancer deaths, according to HSE’s cancer burden study, with the regulator estimating the annual silica toll at between 592 and 998 deaths, averaged at 789. Silicosis, tuberculosis (TB), kidney disease, chronic obstructive pulmonary disease and arthritis are among the other harmful and sometimes deadly consequences of silica exposure. How does silica dust hurt you? Workplace silica exposure can cause potentially fatal cancers and lung and kidney diseases, and may lead to arthritis and other chronic health problems. In general, the more you are exposed, the greater the risk. Silicosis A progressive disease in which accumulation of respirable crystalline silica particles causes an inflammatory reaction in the lung, leading to lung damage and scarring and, in some cases, progresses to complications resulting in disability and death. Silicosis is a UK government-recognised prescribed industrial disease. Silicosis can be complicated by bacterial infections including pulmonary tuberculosis (silicotuberculosis). Lung and other cancers HSE accepts silica exposure is responsible for several hundred lung cancer deaths in the UK each year. Silica-related lung cancer is a UK government-recognised prescribed industrial disease. The International Agency for Research on Cancer (IARC) notes: “Crystalline silica in the form of quartz or cristobalite dust is carcinogenic to humans (Group 1).” In the US, the safety regulator acknowledges the lung cancer association and says there is more limited evidence of associations with laryngeal, stomach and oesophageal cancers. Other respiratory diseases HSE and other regulatory agencies including OSHA accept silica exposure can cause chronic obstructive pulmonary disease (COPD) and impaired lung function, with affected workers frequently diagnosed with work-related emphysema or chronic bronchitis. Renal and autoimmune diseases HSE publications acknowledge the link between kidney disease and silica exposure. According to the US regulator OSHA: “There is also suggestive evidence that silica can increase the risk of rheumatoid arthritis and other autoimmune diseases. In fact, an autoimmune mechanism has been postulated for some silica-associated renal disease.” It adds: “OSHA preliminarily concludes that there is substantial evidence that silica exposure increases the risks of renal and autoimmune disease.” Renal disease caused by silica exposures can be deadly. Studies have linked silica exposure at work to sarcoidosis and scleroderma. Despite its deadly pedigree, HSE’s strategy to deal with this silica has, by its own admission, been fatally flawed. HSE’s silica baseline study,(1) published in 2009, found in the stonemasonry industry approaching half the workforce could be exposed above the 0.1mg/m³ ceiling, and about one in five was potentially exposed to 0.3mg/m³ or more. At the time of publication of the baseline study, back in Barnard Castle, those TASL workers were to face a further three years of damaging dust exposure before HSE returned. HSE had received the company’s written assurance, and that was going to have to suffice. “There were no interventions by HSE at the company between 2008 and 2012 following receipt of written confirmation detailing the improvements they had made following the inspections in 2007,” an HSE spokesperson told Hazards. It was only when HSE revisited the firm in October 2012 that it found little action had been taken. Exposures were still high, equipment was still poorly maintained. The TASL workers might have good reason to believe HSE should have done more – and sooner – too. Their future may still include silica-related diseases. “HSE did not allege in the prosecution case that the admitted breach of health and safety regulations had resulted in any relevant diagnosis or ill-health, however a latency period of normally between five and 30 years applies for many conditions associated with exposure to RCS,” the HSE spokesperson said. She added HSE was not allowed to release “sensitive” personal health data. The case of Terry McGough, 54, is a telling illustration of the need for early and effective enforcement interventions. The £30,000-a-year private Stonyhurst College recruited the stonemason in June 1999 as its 200-year-old buildings needed extensive repairs. For over a decade, Stonyhurst failed to take any measures to monitor or reduce the exposures. HSE’s intervention came years too late to save Terry’s health. In 2011 he was diagnosed with silicosis. Four months later he was sacked. The UK and the US share the same 0.1 mg/m³ workplace exposure standard for respirable crystalline silica – for now. 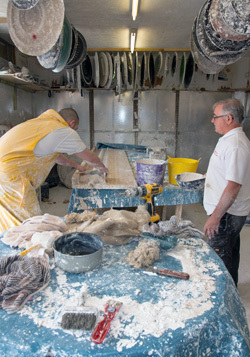 DUST EVERYWHERE Over half a million workers in the UK, like these making plaster mouldings, are routinely exposed to silica dust. The US regulator OSHA says the standard is over four decades old and based on what we knew about silica in 1968. In 1974, the US government’s occupational health research institute, NIOSH, recommended cutting the current 0.1 mg/m³ standard in half. Since then a welter of evidence has confirmed risks including lung cancer, evidence OSHA says justifies this long overdue move. In September 2013, it laid out in the Federal Register(2) its case for the new, more protective 0.05 mg/m³ silica exposure standard. OSHA head David Michaels, whose agency is holding rulemaking hearings on the proposed 0.05 mg/m³ exposure limit, commented: "Exposure to silica can be deadly, and limiting that exposure is essential. Every year, many exposed workers not only lose their ability to work, but also to breathe. 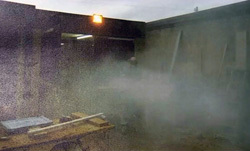 The response in Europe – and from HSE – could not be more different, even though the European Commission’s expert Scientific Committee on Occupational Exposure Limits (SCOEL)(3) in 2003 recommended an official exposure standard “should lie below 0.05 mg/m³ of respirable silica dust.” It noted that this standard would reduce but not remove the risk of silicosis. HSE though argued behind closed doors at the EC’s Advisory Committee on Safety and Health (ACSH) for the current UK standard of 0.1 mg/m³, and for any new Binding Occupational Exposure Limit (BOEL) to be under the more general chemical agents directive (CAD) rather than the more prescriptive carcinogens directive (CMD). It was a position at odds with some other national regulators and unions, but wholly consistent with that put by the Employers’ Interest Group on ACSH. At the moment, only five EU countries – Austria, Hungary, Luxembourg, Poland and Slovenia – have a weaker standard than the UK’s, and three – Finland, Italy and Portugal – already have standards at or below the proposed US standard of 0.05mg/m³. Several Canadian jurisdictions have, like Portugal, a respirable crystalline silica standard of 0.025mg/m³. Germany goes further, regulating silica as a carcinogen, meaning all exposures should be avoided. Excerpt from Developing a silica exposure control plan, WorkSafe BC, British Columbia, Canada. Still, the arguments over whether the tighter limit could be measured accurately in a workplace setting and adhered to in certain industries swayed the European standard setters. A December 2012 opinion agreed by the tripartite – government-employer-union - ACSH group backed a binding limit of 0.1 mg/m³, although it made no firm recommendation on whether it should be implemented under the CAD or the CMD directive. The exposure standards debate both sides of the Atlantic has been heavily influenced by industry lobbying. It was a situation that led OSHA to request that those submitting scientific comments to the agency should declare financial conflicts of interest, a measure it felt was a wholly reasonable stipulation. “There is a broad consensus in favour of transparency about funding sources,” said OSHA head David Michaels. 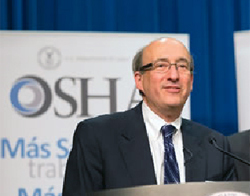 REAL LEADERSHIP David Michaels, head of the US safety regulator OSHA, is holding public hearings to press the case for better worker protection from silica-related diseases. In the UK, the Health and Safety Executive (HSE) is arguing behind closed doors against any tightening of this silica exposure limit. But politicians, a key target of the industry lobbyists, were quick to object. A group of powerful US senators, (5) in an open letter to OSHA, said they were “very concerned about OSHA’s attempt to have commenters disclose their financial backers”. The letter said the request “raises questions” that OSHA might “prejudge the substance” of comments on the basis of such disclosures. In Britain, the pressure for improvements is not coming from the regulator. The Health and Safety Executive (HSE) has instead been accused by one US expert of taking a position “frighteningly similar” to that of industry lobbyists attacking the proposed OSHA standard. HSE’s silica online “community” is a case in point. 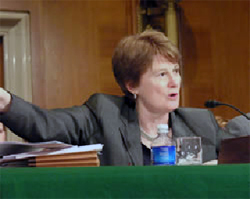 The virtual – and virtually moribund – substitute for enforcement employed by a watchdog with a dramatically reduced workforce, shrinking budget and a trust system in play for even established law breakers - offered little to assist workers exposed to silica, but did provide a platform for those same industry lobbyists. In July 2014, after questioning by Hazards about the posting of a pro-industry study with crucial annexes absent, the silica web community disappeared, absorbed into a wider ‘Occupational diseases’ web community. This 30 January 2014 paper was financed by EUROSIL, the European trade body for industrial silica sand producers. With fracking set to increase its market massively – and linked to exposure levels way in excess of even the current standard – it sees a requirement for smaller exposures as a big headache. FRACKING BOOM With untapped reservoirs of oil and gas trapped in the rocks under our feet, the oil industry is eager to get fracking in the UK. But in the US, where the industry is already well established, out-of-control silica exposures – ten times the current limit - are one of a series of deadly problems to have emerged. 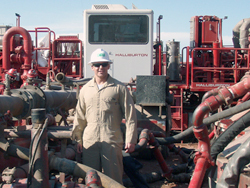 The fracking industry is a major silica user and has been one of the most vocal opponents of a proposed tighter US exposure standard. See: Fracking boom: Chemicals, dust and deaths and the new rush for oil and gas, Hazards, number 126, April-June 2014. The document has been used by the industry to support its campaign in Europe against a more stringent crystalline silica exposure standard. It also sets out to block the group 1 International Agency for Research on Cancer (IARC) carcinogen’s (7) regulation under the EU-wide workplace carcinogens rules. And it comes up with some cash figures to support these conclusions, saying regulating silica as a carcinogen would result in “additional efforts of 152 billion Euros for a 10-year period (2015-2025)”. That’s without tightening the standard. But its sums don’t appear to add up, and discount the cash as well as human benefit of keeping people in work, out of their sick beds and absent from an early grave. Despite claiming to be a “socio-economic impact study”, the EUROSIL report only considers the economic impacts, and then based only on a survey of companies. ‘Social impacts’ in the analysis are limited to the potential for costs-related job losses. There is no attempt to estimate the wider societal costs of making people sick and slowly killing them and the related burden borne by their families, community and the public purse. Or of the potential for jobs lost as a consequence of silica-related disability. As evidence, the report cites a 2011 report – the SHEcan study(9) – conducted by the Institute of Occupational Medicine (IOM) and commissioned by the European Commission. In reality, the SHEcan study reached a wholly different conclusion to that claimed by the trade groups. “There is estimated to be a significant benefit from introducing any of the proposed OELs with benefits greatest with an OEL set at 0.05mg/m³,” the study concluded. Looking at costs, IOM found: “Health benefits of the proposed OELs have been analysed at the Member State and industrial sector level… The monetised benefits were estimated at €28-74bn over the period 2010-2070.” The economic impact over the same period was “estimated to be around €34bn.” And thousands more workers each year would live to reap the benefits as consumers, taxpayers and family members. The tighter standard would deliver a cash and a health payoff. Even so, some experts believe IOM’s report played into the hands of the industry lobby. IOM’s methodology gives a worst case costs comparison calculation. Factoring in “widespread non-compliance,” IOM is not just considering the cost of reducing the standard from 0.1mg/m³ to 0.05mg/m³, but upping the costs to take account of having to drag the lawbreakers even further to comply. Henning Wriedt, a German expert involved in the European standard setting process who supports a more stringent standard, says the IOM calculation is misleading as it gives a value based in a large part on non-compliance with the existing standard rather than the potential addition cost of shifting from the current to a tighter standard. It also assumes, without any credible reason for this supposition, that those not complying now would adhere to a tightened standard and bear the commensurate costs. Given that the economic impact is a crucial factor in the standards setting debate, this means by this IOM methodology the more firms disregard the existing standard, the greater the likelihood they’ll fend off calls for tighter regulation. “Or, in other words, the worse the current situation, the less likely a lower BOEL,” Wriedt told Hazards. UK representatives at the EC deliberations, though, backed the IOM approach. This UK-supported approach accepts there is widespread non-compliance with 0.1mg/m³ but assumes there would be total compliance with the 0.05mg/m³ standard, creating a grossly inflated compliance costs figure for the improved standard. It makes neither mathematical nor methodical sense. A more detailed cost calculation by the US safety regulator OSHA concluded that the cost savings of a shift to the more stringent standard out-weighed the compliance costs by a factor of eight. OSHA’s more detailed, 1,402 page Preliminary economic analysis and initial regulatory flexibility analysis(10) of the proposed silica rule addresses specifically the dangers of failing to tot up both cost and benefit sides of the ledger. There are other potentially life-threatening problems with HSE’s reluctance to reduce the exposure standard. In general, the higher your cumulative dose, the greater your subsequent risk of disease. And long-term exposure at the current 0.1 mg/m³, by overwhelming and permanently damaging the body’s defence mechanisms,(11) leads to a greatly elevated risk of fatal disease if the worker subsequently experiences periods of much higher exposures. It could be a particularly costly phenomenon for the UK workforce, which is set to face a larger legacy of silica-related ill-health than many of its industrial counterparts. The UK was a late adopter of even the 0.1 mg/m³ standard, only moving from 0.3 mg/m³ in 2006. Silica is a progressive disease that can continue to worsen after exposure has ended. It is linked to a higher risk of lung cancer. Silica-related lung cancers have a latency period of years between exposure and the appearance of tumours. The next generation of silica disease victims faced government-sanctioned exposure levels three times those long established in the US, but only introduced in the UK less than a decade ago. If you discount the health arguments, advocates of a tighter exposure standard for silica at work face other more technical objections to an improved standard. The industry and HSE both maintain it is not feasible at workplace level to measure respirable crystalline silica down to the 0.05mg/m³ level. HSL’s Peter Stacey wasn’t doing routine monitoring of worker exposures, but he was measuring to a sensitivity over five times that needed to monitor the proposed 0.05mg/m³ exposure limit. Over in the US, their government safety boffins think policing this standard shouldn’t be a problem as the technology is already available off-the-shelf. In a 26 June 2014 statement, HSE spelled out to Hazards its no change necessary position on respirable crystalline silica, both in the UK and Europe. “Looks like some doubt sowers are in the HSE,” said Monforton. 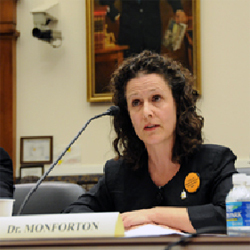 MANUFACTURING DOUBT Dust disease expert Celeste Monforton from George Washington University in the US, is concerned the UK regulator HSE is taking a “frighteningly similar” line to the industry lobbyists objecting to more protective silica exposure limits. Certainly, the conclusions reached by both HSE and HSL, its laboratory arm, seem to be strikingly dissimilar to those reached by their US equivalents, OSHA and NIOSH. In other words, what HSE concluded in May 2014 is “not currently practical”, OSHA had some time before concluded “is technical feasible” in real-life workplace settings. While HSE and its research arm HSL have spent a decade saying monitoring a silica exposure standard of 0.025mg/m³ just isn’t possible in a workplace setting, their equivalent in the Canadian province of British Columbia has been doing it as a matter of routine. In September 2009 in the City of Kamloops, for example, occupational hygiene inspector Geoff Thomson was sampling respirable crystalline silica exposures in road surfacing crews. But there is a secondary factor at play. In the US, the regulator believes tightening the standard will drive improvements in monitoring methods and technologies, something NIOSH researchers are already developing. When it comes to saving lives, necessity really is the mother of invention. Peg Seminario, director of health and safety at the US national union federation AFL-CIO, also gave evidence at the OSHA rulemaking hearings. MAKE IT HAPPEN US union safety expert Peg Seminario says HSE should be pushing improvements in safety standards and monitoring technology like its US counterpart, OSHA. Even so, the existing NIOSH method is validated to 0.02mg/m³, significantly more sensitive than the 0.05mg/m³ level necessary to monitor the proposed standard. And, Seminario says, high flow rates on sampling pumps and longer sampling times can overcome many of the difficulties. She points out some industrial hygiene firms in the US already employ these methods. “When the standard is lowered, it is certain that there will be better methods because there will be a demand for it. Hopefully this will include better real time monitors and direct reading instruments which can be used in place of personal monitoring,” Seminario said. She points out these systems are already required under new rules on coal dust in mines. Unlike OSHA, however, HSE does not see itself as a game changer – even though it has been pressed like OSHA on the monitoring issue. But the HSE confirmed nearly a decade on, for HSE at least, the world had stood still. The May 2014 meeting of ACTS had discussed this point, and decided there would be no safer standard. HSE is playing wait and see if a monitoring solution comes along. OSHA, protecting US workers, is saying the tighter standard is necessary, so make it happen. For UK campaigners for more stringent controls on silica, HSE’s reluctance to shift sounds ominously familiar. In the late 1990s, HSE presented a rigid defence of the then 0.3mg/m³ standard, but faced growing criticism as a result. By 2003, HSE’s regulatory impact assessment had discovered its critics were in the right, and recommended a shift to a 0.1mg/m³ silica exposure standard, noting it was “the level at which HSE believes UK industry could comply (with costs) and where compliance could bring a significant health benefit.” (12) By 2006, the new tighter standard was in place. Over a decade later, the US authorities think these technical barriers have been overcome. HSE, meanwhile, appears to suggest that, in a decade that witnessed unprecedented technological advances that have seen dust samples obtained on Mars, improvements in earth-bound monitoring of silica dust exposures that HSE believed in 2003 were “achievable” remain “not currently practical”. How many have died as a result of HSE’s defensive dithering is uncertain. The OSHA estimates suggest halving the standard would save hundreds of people each year from cancer and debilitating lung and other diseases. It is a move the US regulator believes is justified, possible and long-overdue. Whatever the standard in the UK, it becomes an irrelevance if rogue employers know they can ignore it entirely for years with little prospect of being caught. For workers like Terry McGough, there’s no escaping the consequences – a life spoiled and in all probability cut short. 1. Silica baseline study, HSE, 2009. 2. Occupational exposure to respirable crystalline silica: A Proposed Rule by the Occupational Safety and Health Administration on 09/12/2013, Federal Register, 12 September 2013. 3. Recommendation from the Scientific Committee on Occupational Exposure Limits for silica, crystalline (respirable dust), SCOEL/SUM/94, SCOEL, November 2003. 4. Full disclosure: Regulatory agencies must demand conflict-of-interest statements for the research they use. Editorial, Nature, volume 507, issue 7490, page 8, 6 March 2014. 5 .Dust regulations trigger backlash, Nature, volume 507, issue 7490, page 18, 6 March 2014. 6. BIPRO. A socio-economic impact study to an EU limit value for process generated respirable crystalline silica in the Chemical Agents at Work Directive compared to the Carcinogens and Mutagens at Work Directive, Final Report, 30 January 2014 [executive summary]. 7. IARC Monograph Volume 100C. A Review of Human Carcinogens: Arsenic, Metals, Fibres, and Dusts, International Agency for Research on Cancer, Lyon, 2011. 8. Contribution to the impact study on the revision of the Carcinogens Directive (2004/37/EC) undertaken by European Commission DG EMPL Unit B3 [report by 18 industry groups], 30 August 2013. 9. JW Cherrie and others. Health, socio-economic and environmental aspects of possible amendments to the EU Directive on the protection of workers from the risks related to exposure to carcinogens and mutagens at work: Respirable crystalline silica, IOM Research Project P937/8, May 2011. 10. Preliminary Economic Analysis and Initial Regulatory Flexibility Analysis: Supporting document for the Notice of Proposed Rulemaking for Occupational Exposure to Crystalline Silica, OSHA, US Department of Labor, 2013. 11. A Seaton and JW Cherrie. Quartz exposures and severe silicosis: a role for hilar nodes, Occupational and Environmental Medicine, volume 55, pages, 383-386, 1998. 12. A Regulatory Impact Assessment (RIA) on proposals to reduce the UK Occupational Exposure Limit for Respirable Crystalline Silica (RCS), HSE, 2003. [Listed on the National Archive ‘Regulatory impact assessments’ webpages]. HSE silica webpages and additional information on reducing exposures to silica in the workplace and Health surveillance for those exposed to respirable crystalline silica (RCS), G404, 2011. Stonyhurst College was handed a six figure fine for the criminal safety breaches that left an employee out of work and with a life-threatening lung disease. Preston Crown Court heard in May 2014 how the ‘inexcusable’ failings at the £30,000 a year private school in Clitheroe caused stonemason Terry McGough to develop silicosis, a condition that saps your energy and leaves you fighting for breath. The 54-year-old grandfather was employed by the college for almost 12 years, during which time he was exposed to extremely high levels of silica dust. 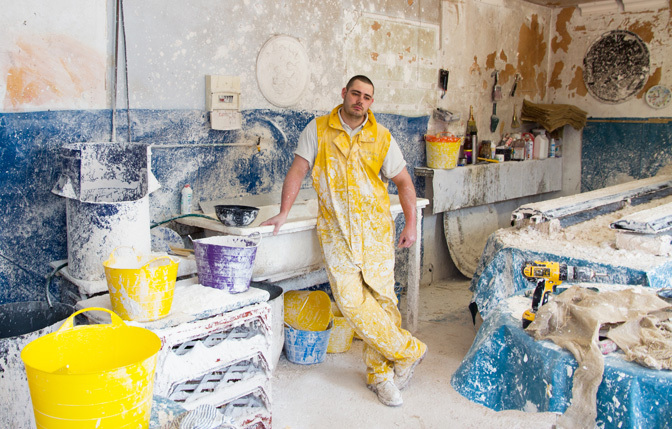 His silicosis diagnosis came in July 2011, four months before he was made redundant. He won an unfair dismissal case against the school in 2013. The court was told how Mr McGough and his colleague Oliver Bolton had been exposed to the lung-scarring dust as they worked to preserve the Jesuit college’s sandstone buildings. Their workshop (above) was inadequately ventilated and when Mr McGough asked for conditions to be improved, he said his request was brushed off. HSE inspector Mike Mullen commented: “There was no attempt by the college to assess and manage its workers’ exposure despite having their attention drawn to the risks by its own health and safety consultant in 2008. “A worker who was previously very active now struggles to play outside with his grandchildren, and will suffer breathing difficulties for the rest of his life. In a 26 June 2014 statement, HSE spelled out to Hazards its position on a respirable crystalline silica, both in the UK and Europe. “In the UK the Control of Substances Hazardous to Health Regulations 2002 (as amended; COSHH) implement the provisions of the Chemical Agents Directive (CAD) under which the regulation of Respirable Crystalline Silica (RCS) currently falls. “COSHH requires employers to adequately control exposure by applying the principles of good practice including the requirement to “control exposure by means proportionate to the health risk” and to control exposure to below the workplace exposure limit (WEL). The current WEL for RCS is 0.1 mg/m³ (8-hour time weighted average). 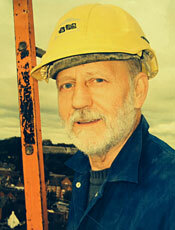 “The risk based approach used in the COSHH regulations emphasises the requirement for good control practice. Employers are required to demonstrate exposure control to levels as far below the WEL as possible rather than reducing exposures to the numerical limit. “HSE’s consideration of the WEL for RCS has focused on the ability to reliably measure below this limit in the workplace. Although under controlled conditions it is technically possible to measure below 0.1 mg/m³ results of work undertaken by the Health and Safety Laboratory have shown that this is not currently practical within a workplace setting. “Discussions on the measurement of RCS below the current WEL have taken place at meetings of HSE’s Advisory Committee on Toxic Substances (ACTS) in November 2012 and October 2013. The issue was also more recently discussed at the May 2014 ACTS meeting where HSL presented recent work on measurement technology… Following this latest discussion, it remains the case that it is not currently practical to measure below the current WEL. “At the meeting of the [EC] Government Interest Group, and at the subsequent plenary meeting of the Advisory Committee on Safety and Health (ACSH), the UK Government supported the Opinion from the Working Party on Chemicals and its endorsement by the ACSH. The Opinion covered a number of general issues associated with the proposed amendment to the Carcinogens and Mutagens Directive, including the need to develop methodologies for deriving binding limit values and the development of the principle of prevention and minimisation of exposure under the Directive. It also covered proposals for binding limits for nine substances, of which RCS was one. “The ACSH have recently decided to make their Opinions publically available and these can be obtained by contacting the European Commission as the body who provide the Secretariat for the Committee. Silica exposures kill over 1,000 workers a year in the UK and leave many more fighting for breath. But, unlike its US counterpart, the Health and Safety Executive (HSE) is following the industry line and says our deadly silica exposure standard is just fine. • How does silica dust hurt you? Also see Part 2 of our silica series, A line in the sand: Foot-dragging HSE must back better controls over silica at work, Hazards, number 127, July-September 2014.